Looking west over the new collector-distributor lanes on March 1, 2018. The traffic in the background is traveling on the ramp from I-64 east to I-264 east. 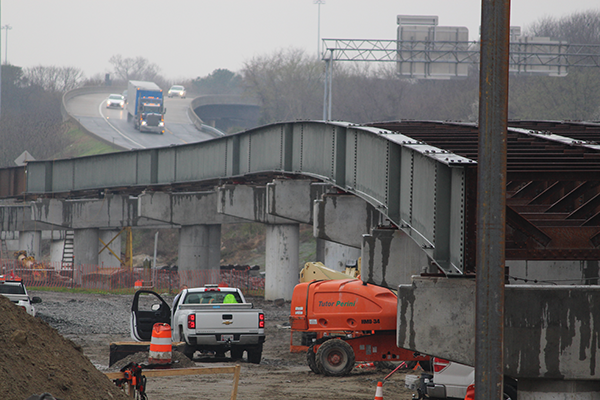 Girder installation progressed rapidly in February and March on the ramp and collector-distributor lanes that will serve the Newtown and Witchduck road interchanges on I-264 east. The collector-distributor lanes, looking east toward the Newtown Road exit on March 29, 2018. 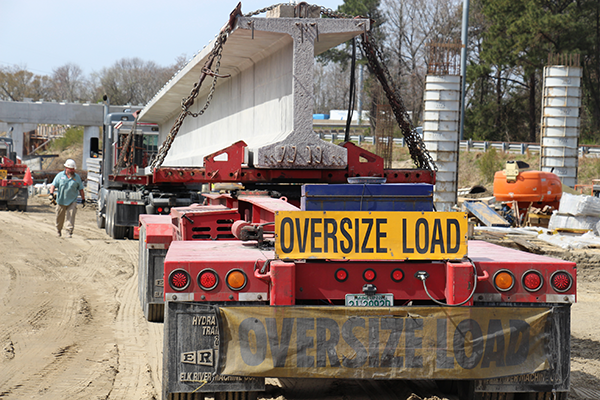 A steel-reinforced concrete I-beam is delivered to the project (above) on March 29, 2018. 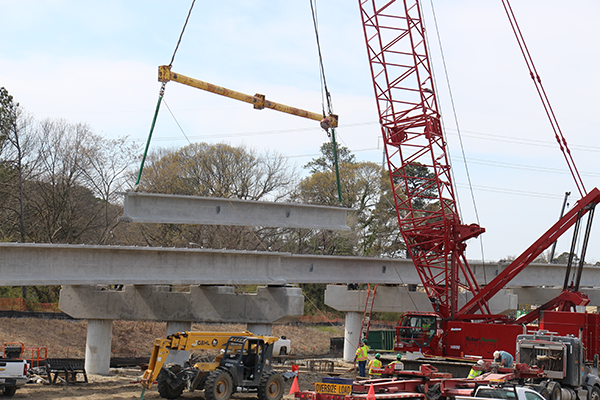 It is hoisted and placed (below) as workers construct the ramp that will connect I-64 west to the collector-distributor lanes serving Newtown Road, Witchduck Road and I-264 east. 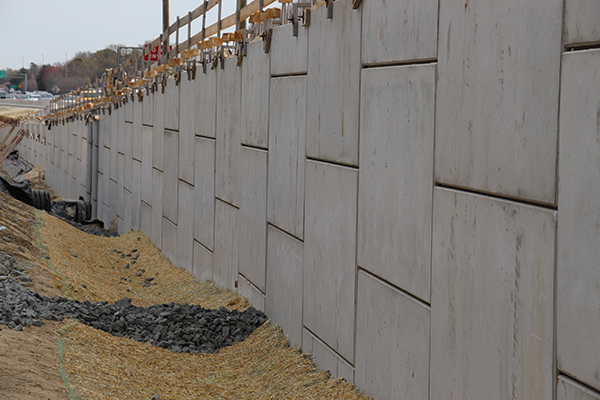 A portion of the project along I-64 west came into focus as crews finished placing panels on the retaining wall behind Ivor and Edison avenues. Still to come: backfilling, drainage work and construction of the road overhead. 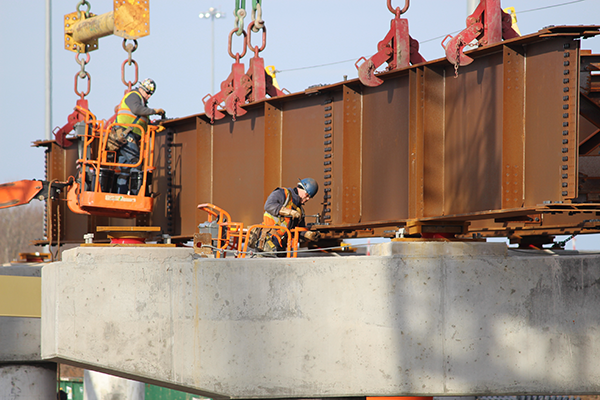 The structure will lead to the Curlew Drive overpass. 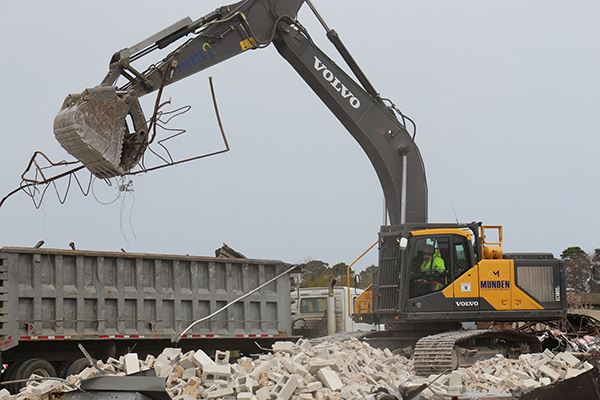 A demolition crew removed the former 7-Eleven building at the intersection of Newtown and Greenwich roads the week of March 26. Upcoming activity in that area will include demolition of the islands in Newtown and Greenwich roads and ramp widening work at Exit 15A. 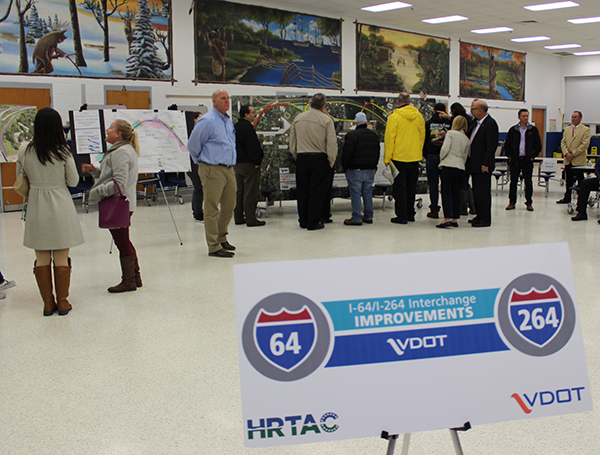 VDOT held an informational open house March 6 at Kempsville Elementary on the two I-64/264 Interchange Improvements projects (Phases I and II) underway in the corridor. About 50 people attended. Questions about the work? Contact VDOT's Dave Forster at 925.2583 or dave.forster@vdot.virginia.gov. A detour will direct traffic to Center Drive and Newtown Road. The contractor is developing a plan to close Curlew Drive near the I-64 overpass for as many as three to four weeks. The dates of the closure and the detour plan will be announced when the work is scheduled. The road closure will allow crews to move water and sewer force mains to make room for a large stormwater pipe that must be installed below Curlew Drive. The drainage pipe, which measures 5 feet across, is part of the project's stormwater management system. Motorists should be aware that shoulders along I-64 west and a portion of I-264 east are closed for construction.